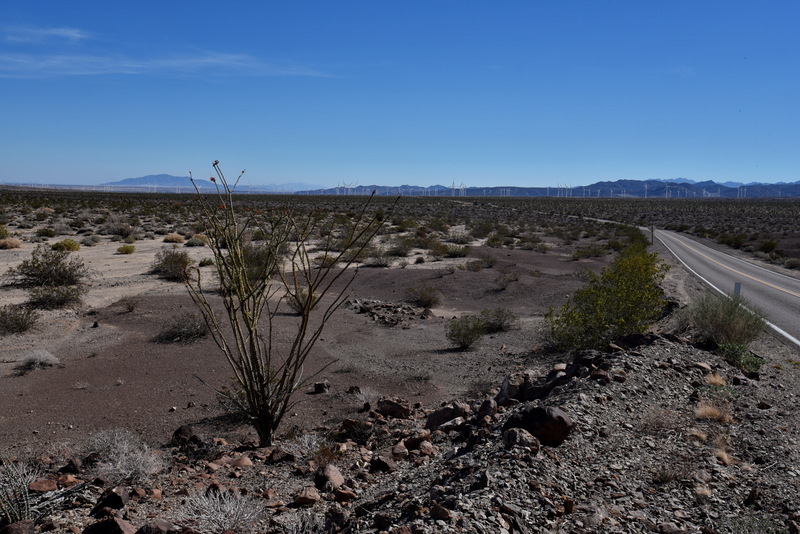 Ocotillo tree (Fouquieria splendens) in leaf, a sign of recent rains in this otherwise barren landscape, just north of the settlement of Ocotillo. Today we enjoyed our annual outing to the Anza Borrego Desert State Park, part of the Colorado Desert. There were three of us today as Eunice had invited Ken Shaw from the Long Beach and San Gabriel Clubs to come along as well. After Eunice had destroyed her sunglasses we set off along the I-5 towards San Diego then headed east along the I-8 to Ocotillo, past the café where a few year’s back we had an awful breakfast with freshly defrosted out-of-date orange juice. At least we were not charged for it after we complained! There have been some major changes here since Angie and I passed by a year ago, with some 100 wind turbines now turning along the skyline. There was brand new asphalt until we had passed through the wind farm, presumably paid for by the construction company. The usual check point by the U.S. Customs and Border Protection Service was still there and quickly cleared us after seeing my Dutch passport. I guess that we’ve travelled through Anza Borrego at least once a year since 2008, usually in February, when the field flowers are just breaking into flower, followed by the majority of cactus species some two weeks later in March. 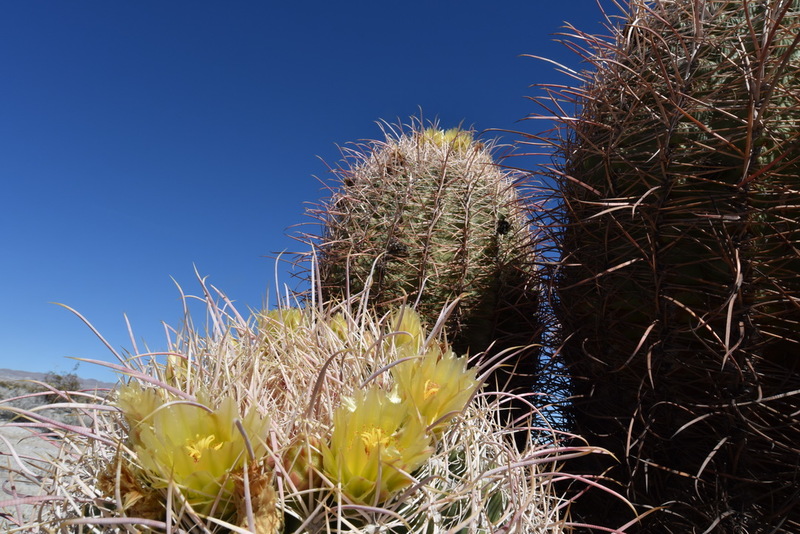 Rather than listing each stop, I’ve filed my images under two stops – those in the lower desert are under S3245 with Ferocactus cylindraceus with its yellow flowers in full bloom with buds indicating that there is more to come. 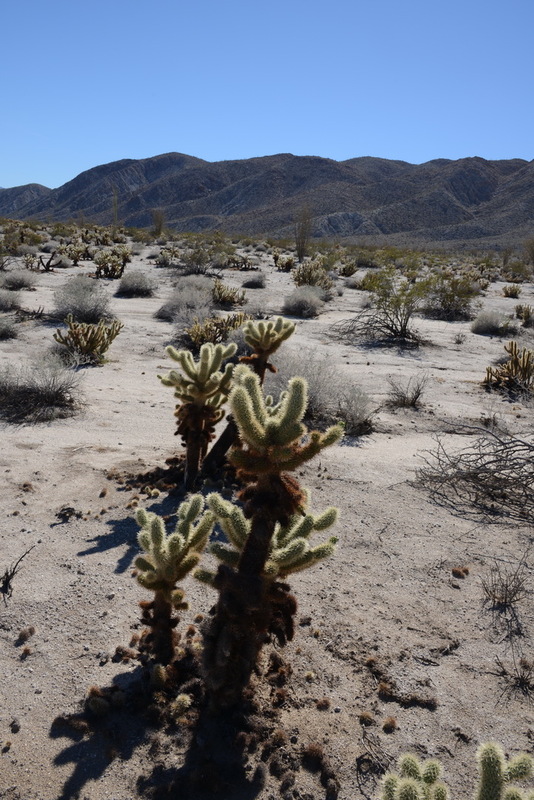 Although we do not intentionally collect cacti, it is impossible to walk between the Feros and not pick up some cladodes of Cylindropuntia bigelovii, the Teddy Bear Cholla. Yes, they look cuddly, but stay clear as they jump on to your shoes and trouser legs. Check your clothes and boots before you get back into the car! The next stop, S3246 was in the hills that overlook the lower desert, where in the past Echinocereus engelmannii and Opuntia basilaris delighted us with their flowers, but this time they were still in early bud. 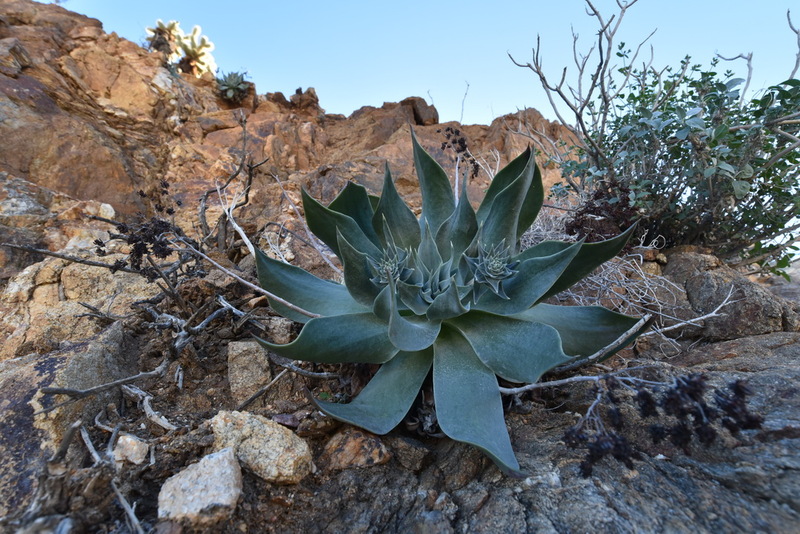 However, the Dudleya pulverulenta subspecies arizonica were in great form, growing on the rocky cuttings right alongside the road. Dudleya pulverulenta subsp. arizonica growing far away from the usually coastal Dudleya locations. Since 2008, it has become a tradition to stop off at the Julian Pie Company in Santa Ysabel, right along Hwy-79 for a helping of Dutch Apple Pie with cinnamon ice cream, yum-yum! So good in fact that we decided to bring a whole pie and a pot of ice cream back home as a souvenir that won’t last too long. I think that Ken was impressed with our laid back approach to cactus exploring. We now also have a wonderful cake shop, right on the Vallenar crossroads, if you ignore the new dual carriage way and take the old road instead. I should mention that Ken was a champion guitar picker in the 1981 picker’s fare in Julian. I wish I had been a fly on the wall! And so another Friday 13th passed without incident, apart from heavier than usual rush hour traffic despite the fact that today was a holiday. Tomorrow we go to the San Diego Cactus Show and Sale.